We have developed a transparent, cross-link polymer bond that creates a protective barrier against oil, mold and mildew in these types of materials. VC-3 helps protect from permanent staining and creates a cleanable surface. Guaranteed for 5 years. 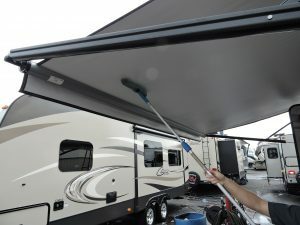 Q: Will VC-3 help with mold on my awning?Yes. Duratain® VC-3 contains mold inhibitors that protects against mold and mildew eliminating permanent staining and creating a easily cleanable surface. Q: My trailer is equipped with vinyl or leather chairs, will you treat them as well?Yes. Duratain® will treat all vinyl and leather fabrics used in the building of your RV. Q: Will VC-3 help stop leather from cracking.Yes, but remember leather cracking is normal and in many cases is part of the look. VC-3 will hold in the leather’s natural oils and prevent it from prematurely cracking, fading and drying out. Q: What is the number one benefit of treating my tent trailer?Treating your tent trailer with Duratain® offers many benefits, however creating a cleanable stain resistant surface is number one in my book.